Controlling Moss on your roof has never been easier. All you have to do is get an estimate from us and leave us to show up to spray your roof at the agreed upon intervals throughout the year and you’ll be one of the few people on your block that never has growth on their roof. Removal of moss may be necessary prior to spraying. Your insurance company will be as happy about this as you will be. Why? Moss growing on a roof causes damage and can void your roofs warranty and your home insurance. 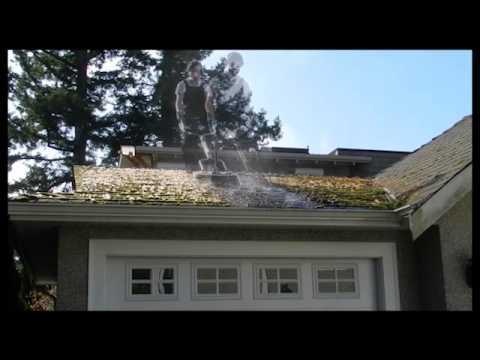 Our method of moss removal is safe for your roof. We use customized equipment to safely and efficiently remove the moss which will save you money. One call to us and this maintenance headache is all taken care of. 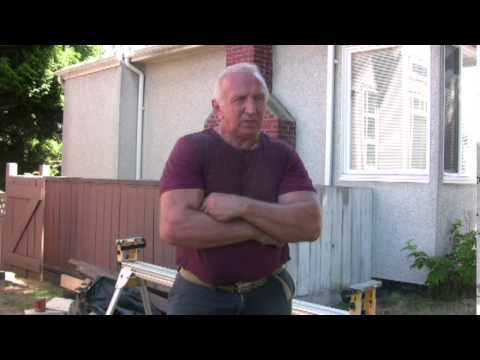 If you’ve watched the video you’ll know that we always use a harness while working on steep roofs like the one above. We value our employees and your liability as well. You can rest assured that when our workers are on your roof, they will be safe at all times. What we use to kill Moss, algae, lichen etc. We use a soap base product that works within the hour of spraying it. It works by getting into the cell structure of the plant and exploding the cell. As soon as this happens the Moss dies very rapidly. On a job that takes two hours, algae on your roof is already fading and the moss dies off shortly there after.